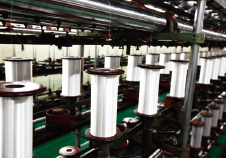 The process of mixing and radiating the tread is adjusted to the characteristics of each product. 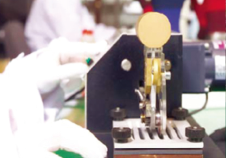 The glove manufacturing process of knitting the internal skin gloves of coated gloves with the automatic glove knitting m/c. 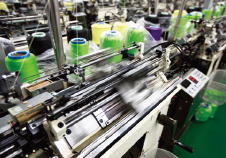 The knitted gloves are placed on artificial hands and moved up and down, left and right along the automatic coating lines. 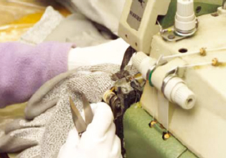 The final machining process consists of inserting rubber bands into the wrist part of the gloves in order to provide good wearability and flexibility. 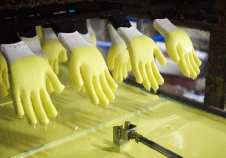 After drying, the logo and other needed symbols are automatically printed on the external part of the coated gloves by screen printing machines. 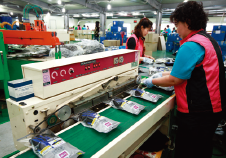 The process of packing the produced gloves into polybags is done by automatic packaging machines.